"Brothers will turn against their own brothers and give them to be killed. Fathers will turn against their own children and give them to be killed. Children will fight against their own parents and find ways for their parents to be killed." 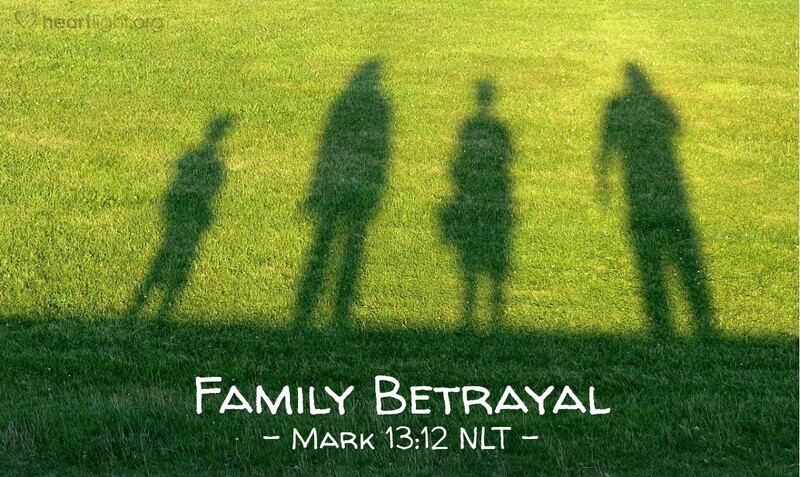 Jesus had warned that his ministry and those loyal to him, could find themselves having to choose between their family and their faith, their circle of friends and their faith. As the hostility of living in a fallen world breaks upon us, betrayal will strike very close to the hearts of believers just as it did to the Savior. We shouldn't be surprised that some in our own family would betray us if one of Jesus' handpicked apostles did the same to him. O Master and God, please help me to be strong enough to withstand the betrayal of those close to me. Please let me never outlive my love for your Son. In Jesus' name I pray. Amen.